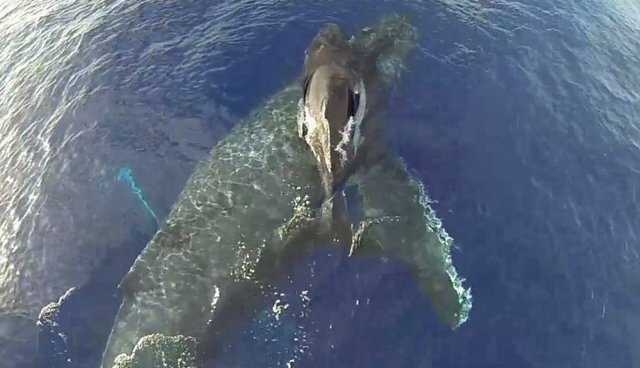 In yet another example of how new technology is helping to reshape the way we see the world and its many inhabitants, a whale-watching drone has captured a sweet scene of a mother humpback and her young calf swimming free in wild. Using a Phantom quadrocopter mounted with a GoPro camera, Justin Edwards managed to film this unique footage of a whale family swimming off the coast of Maui -- offering a rare, up-close perspective that would been unachievable just a few years ago. Edwards, from his website: "Using an aerial photography platform like the Phantom is a great way to raise awareness about whales and encourage people to operate motor vehicles safely in the warm waters around Maui because there are baby whales out there frolicking with their mothers!"